A unique tropical open plan style, this villa has an excellent design for your next tropical holiday. The lounge room opens directly onto the pool deck and there is direct visual access from the kitchen servery to the pool - great for families with small children. The grounds offer complete privacy with a walled garden. The swimming pool is fully fenced and heated during the winter months. Capturing full sun all day, the outdoor area is ideal for relaxing and entertaining. The poolside patio is a perfect setting for alfresco dining and sunset drinks. Spacious interiors provide a cool retreat from the tropical heat. Breezeways, ceiling fans and landscaping features ensure a comfortable stay. The villa has two king size master bedrooms, both with en-suite bathrooms that feature dual showers and practical layouts to cope with all beach and pool activities. The third bedroom is perfect for children with 4 bunk beds and has the use a family sized bathroom and separate toilet. A laundry room has washing machine, clothes dryer and ironing facilities. The villa is directly opposite a large reserve with basketball and tennis courts. A short stroll to the town centre and the northern end of Four Mile Beach means the villa is well located, negating the need for additional transport. 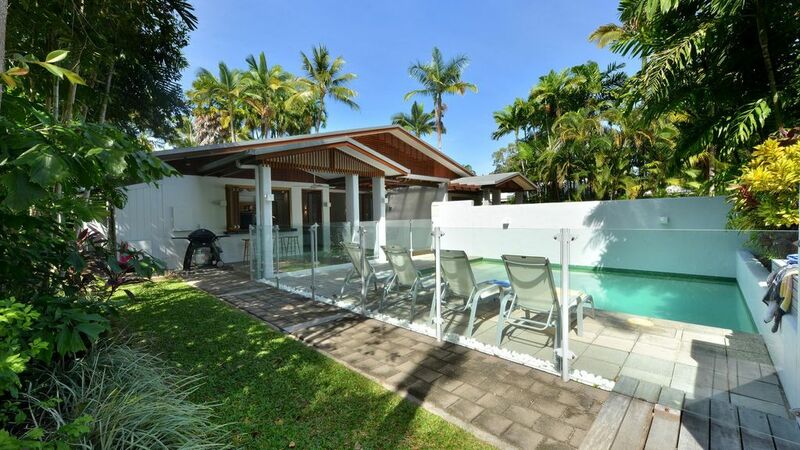 The villa has a comprehensive list of entertainment with 2 TVs, DVD and CD plus Foxtel and WiFi internet connected. Great pool for the kids, close to town and the beach and the kitchen and servery worked well for the chefs.